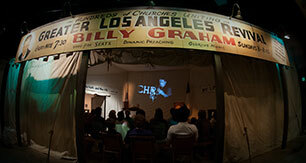 No matter how much our culture changes, the message at the Billy Graham Library never will. For generations to come, visitors will hear “that Christ died for our sins according to the Scriptures, that He was raised on the third day according to the Scriptures” (1 Corinthians 15:3-4). And we have a promise from God. As His word is proclaimed, it will produce fruit. Through your gift to the Billy Graham Library Legacy endowment, you can help reach the spiritually lost and hurting for generations to come.